General Description of a large Lilliput sewage treatment plant. Lilliput® sewage treatment plant models SBC12000 and up are designed for sewage treatment of communities or housing clusters from townships to cities. The treated Lilliput® output is used for irrigation or can be discharged to streams, dams or storm water provisions. Process of a Lilliput® single house / compact sewage treatment plant. Sewage from the septic tank of a house is constantly pumped to the Lilliput® Bio-reactor. The sewage enters the Bio-reactor below the fixed-growth media, here it is mixed by the air diffuser. Effluent/ sewage now moves upward through the system where it comes into contact with the microbes growing on the growth media. This microbial population aerobically degrades and removes organic compounds within the aerated effluent. Some nitrification occurs in the top layers of the media. 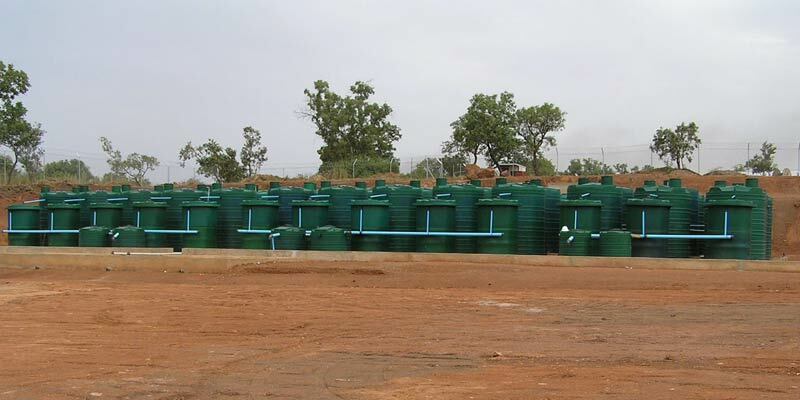 After passing through the media, the treated effluent is sent to a disinfecting contact tank, it is then ready for as irrigation or released to rivers, streams, dams or storm water systems. All Lilliput® sewage treatment plant components can be built into a single unit such as a container or building or can modular to work in difficult topographical conditions. Lilliput® components/ modular systems can be arranged to use gravity thus eliminating the need for an electrical supply, this is great for rural areas. With effluent trickling in and natural up-drafts, a residency of only five (5) minutes can be achieved. Using the treated effluent for irrigation is completely safe and helps with water conservation. For a domestic application, water savings are around 40%. Lilliput® sewage treatment plants physical components. The Lilliput® biological treatment unit uses randomly packed biofilter media with a high surface area to volume ratio, this allows a dense biomass. Lilliput® sewage treatment plants can be installed discreetly above ground to reduce installation costs. Disinfection of treated effluent takes place via chlorination or Ozonation. Incorporating a biocatalyst quickens the speed and enhances the degree of biological degradation in the septic tank therefore extending de-sludging intervals. This also helps lessen the negative impact which kitchen waste such as cooking oil have on the system. The Alpha Biotech catalyst has been successful in sewage treatment. Reduction of sludge, COD removal in the septic tank is improved and general performance of the sewage treatment plant is enhanced, especially when handling abnormal sewage loads.